Tomatoes have been a part of delicious Italian food for centuries. Here at Cervasi, we love tomatoes of all shapes and varieties and look forward to enjoying them even more in the summer. Today’s cooks have many options when it comes to purchasing tomatoes. Fresh tomatoes are ideal for many recipes, and Kansas City-area grocery stores and farmers markets do not disappoint with their assorted varieties. And, of course, we shouldn’t forget that home gardeners don’t have to travel far to pick the perfect tomato from their backyard. To celebrate the seasonal summer goodness of tomatoes, we’re sharing our favorite tips and recipes with you. To refrigerate or not? We’ve all heard that tomatoes shouldn’t be refrigerated for fear of it changing taste and texture. At Cervasi, we prefer our tomatoes to be kept at room temperature — and Kansas City chef and blogger Lauren Lane (read on to learn more about Lauren) is a firm believer in not refrigerating tomatoes. She says they lose their texture and flavor quickly, and “NO ONE likes a mealy tomato,” Lauren says. And we have to agree. Make it a feast for the eyes. 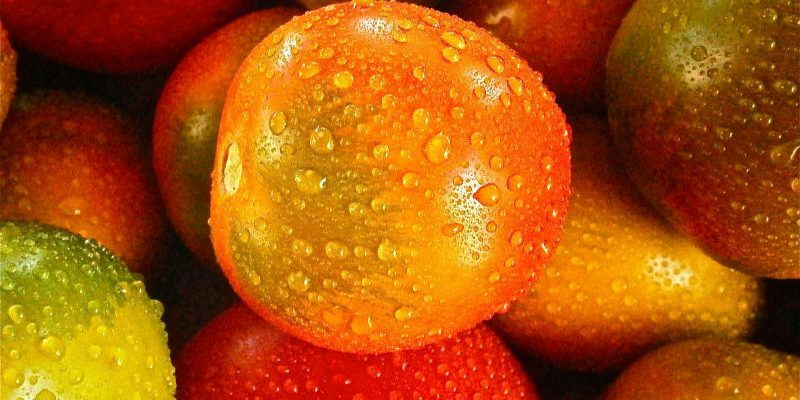 We enjoy tomatoes not only for their taste, but also for their unique colors, shapes and varieties. Thankfully, grocery stores and fruit and vegetable stands offer many choices. If cherry tomatoes are your go-to, change things up and expand your options by choosing a plum, grape or heirloom variety. You’ll still enjoy tomatoey goodness but in a new, eye-pleasing way. Recently, we introduced you to Lauren Lane and our new partnership with this chef, influencer, food and lifestyle blogger and pasta lover. Lauren loves cooking with tomatoes, too and her Easy Peasy Caprese Salad is just one take on how she uses them. Lauren’s recipe pairs cherry tomatoes with mozzarella, Cervasi Extra Virgin Olive Oil, herbs and spices. Simple and delicious! Our Tomato & Arugula Pizza recipe can be baked in an oven – or even cook on a grill. Keep in Touch with Us … and Lauren! For more tempting tomato recipes, check out our recipe archive and Pinterest page. To keep up with Lauren and her partnership with Cervasi, stay connected to our Facebook and Instagram pages. And you can follow Lauren on her blog and learn about her Kansas City-area culinary classes, too.